HONOLULU – As part of the annual “Beat the School Jam” campaign, the Hawaii Department of Transportation today announced plans to suspend construction-related road closures during daylight hours on major highways from – Aug. 24th through Aug. 28th – to alleviate traffic congestion during the week when more than 52,000 university, college, and private school students begin their fall semesters. The Beat the School Jam campaign includes radio commercials that will air during the morning and evening commutes reminding people to plan ahead, consider carpooling or public transportation and watch out for children walking or biking to school. 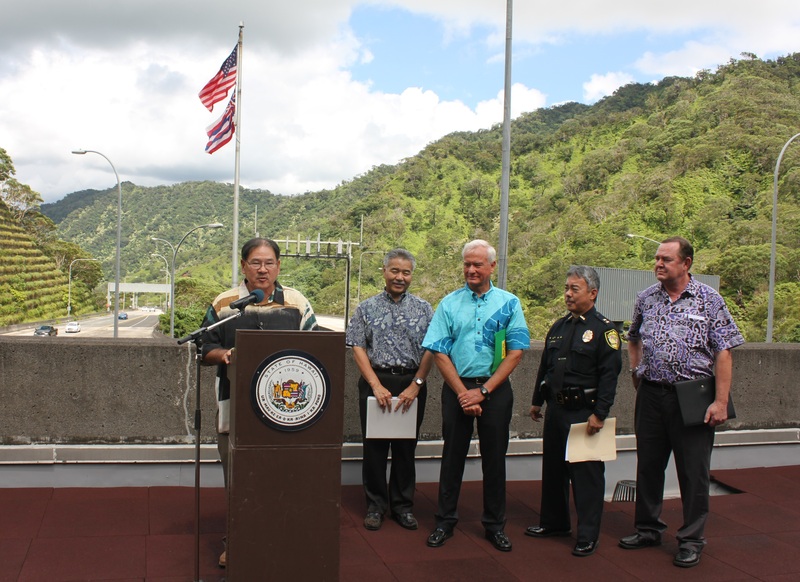 To help provide motorists with real-time traffic information, the HDOT announced the launch of MyGoAkamai, a free personalized alerting service that enhances its GoAkamai traveler information program. MyGoAkamai provides real-time traffic alerts to its users when they need it, where they want it, and on freeway routes that are of interest to them. Simply register at www.GoAkamai.org for this free service. The registration process for MyGoAkamai allows users to select from a number of predefined trips, identify the types of events that are of particular interest, decide when alerts should be sent, and whether they are to be received by email or text. The look and feel of the website has been redesigned to be more responsive. Websites developed with responsive design tools adapt to each display size and modify the layout to conform to the capabilities of the display (i.e., the website adjusts to fit the screen of the device on which it is being viewed). This means that GoAkamai.org supports the growing use of smartphones and tablets. GoAkamai is now better able to support users, whether they’re accessing it on their desktop, laptop, smartphone, or tablet. Weather events and layers are available in GoAkamai. Through its Map Tools, users can select the weather option for real-time weather conditions. For an added level of user customization, a variety of background map views can be selected. Other enhancements include a new page listing incidents, the ability for the user to search for a specific camera image or camera tour; and drive times have been renamed to provide a specific beginning and end point. Travel links as well as weather links have been consolidated and a new social media page lists Twitter feeds from GoAkamai, Oahu Department of Emergency Management and the Hawaii Department of Transportation. The GoAkamai Mobile App for iPhone and Android has been updated as well, consistent with the recent enhancements to GoAkamai.org. Users will now be able to access the same information regardless of platform. Beginning on Monday, Aug. 24th, motorists are advised to adjust their commute times accordingly to avoid peak travel periods and are reminded to properly maintain and inspect their vehicles to avoid becoming potential road hazards. Freeway Service Patrol (FSP) trucks will be on duty every weekday (except holidays) to provide free emergency roadside service to keep traffic moving on the H-1, H-2, and H-201 Moanalua Freeways between the Kunia, Waipio, and Kahala areas from 5 a.m. to 7 p.m. Stranded motorists may call FSP at 841-HELP (4357). A link to FSP and its services is found on GoAkamai.org. Transportation alternatives include biking to work, taking The Bus, and signing students up for public or private school buses. Carpooling or vanpooling with a neighbor or friend can also allow motorists to utilize both High Occupancy Vehicle lanes (two or more individuals per vehicle) on our state highways and the H-1 Freeway ZipperLane and Nimitz Highway Contraflow Lane. During the daytime construction hiatus Aug. 24th through 28th, emergency closures, nighttime construction, and roadwork that does not involve lane closures, such as shoulder maintenance or landscaping work, may still be scheduled. *Accident information is based on a three year average from 2009-2011 for children younger than 18 years old involved in a major traffic accident as a pedestrian or bicyclist in Hawaii. 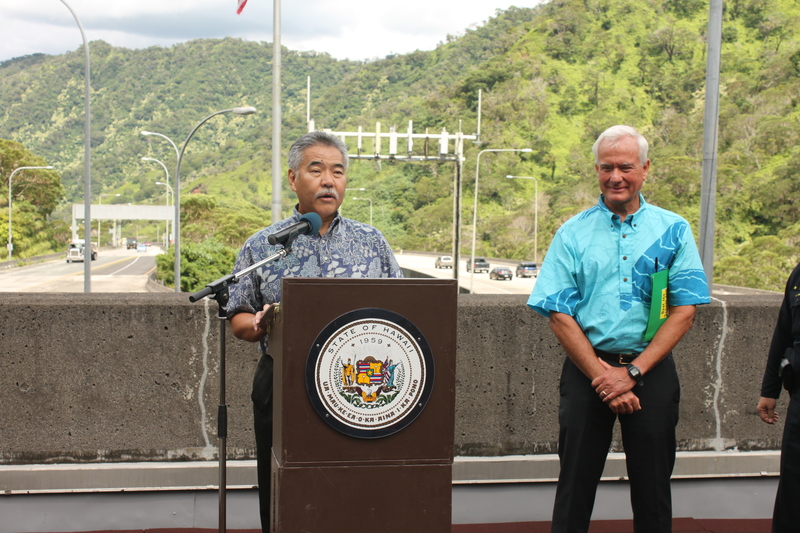 Governor David Ige speaks on behalf of the “Beat the School Jam” campaign and urges drivers to use the new MyGoAkamai personalized alerting service. With the return of more than 52,000 students on Monday, Aug. 24, HDOT Director Ford Fuchigami stresses the importance of planning ahead. 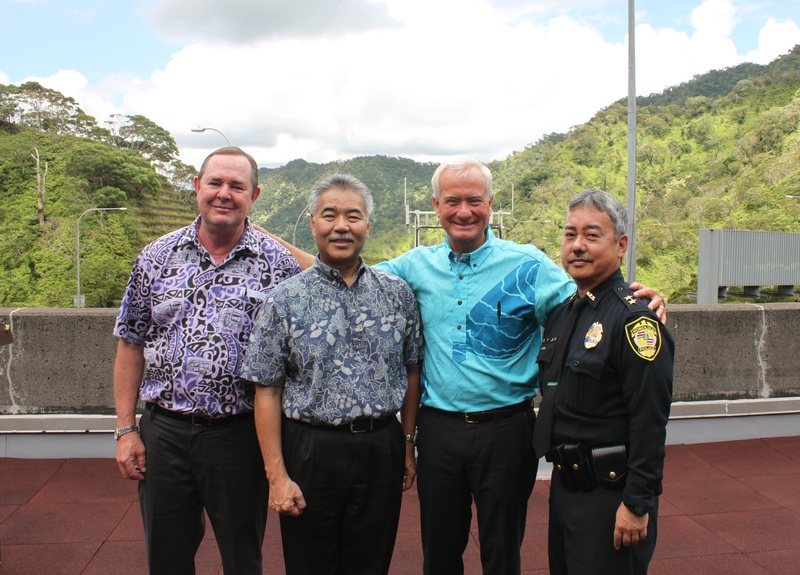 From left to right: Roger Morton, Oahu Transit Services; Governor David Ige; Mayor Kirk Caldwell; and Assistant Chief Jerry Inouye, Honolulu Police Department.